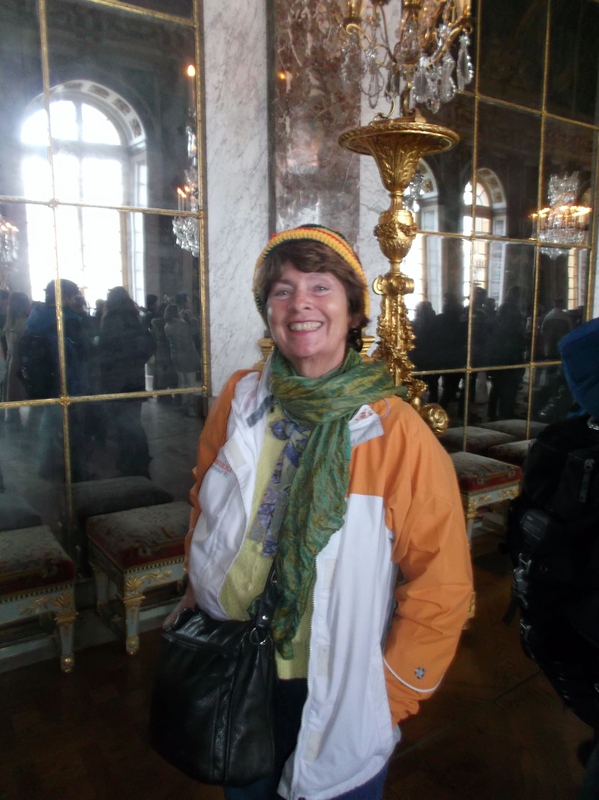 Gwendominica is completely mesmerized by the Hall of Mirrors at the Palais Versailles, a 17th century Chateau southwest of Paris. 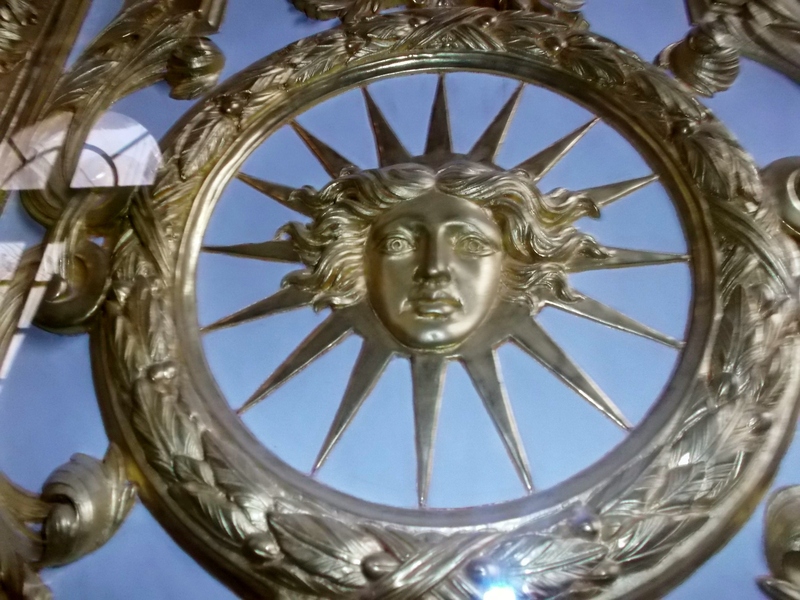 Louis XIV, a.k.a ‘The Sun King’ was an extraordinary man, to say the least. He was a long-lived, powerful, and highly creative monarch who apparently had a number of reasons for identifying with this brilliant star and using it as his emblem. no idea that thousands of residents and visitors would be of like mind! This was to be my only excursion to a suburb of Paris, and I was curious to experience a historic site that many people had highly recommended that I see while in the City of Light. 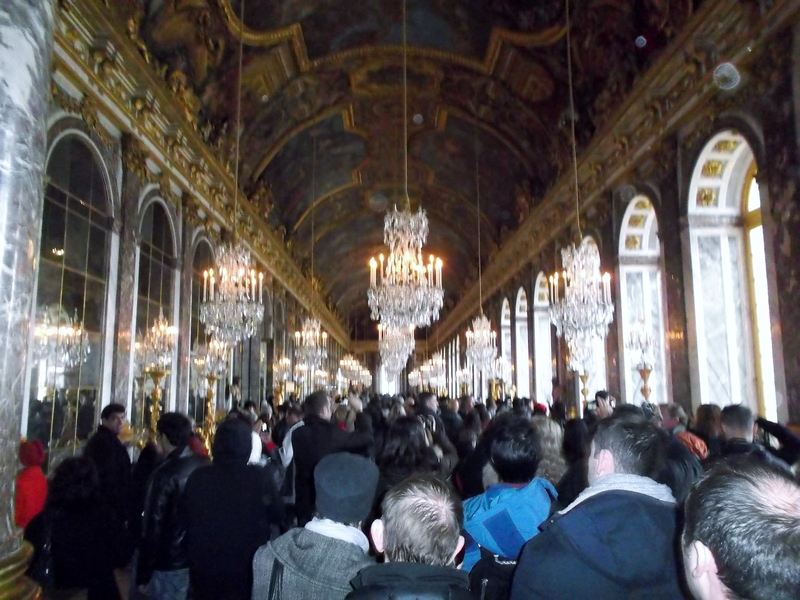 But when we first arrived at the Palace of Versailles, we collectively gasped at the very long line of people patiently waiting their turn to enter ‘the State Apartments’ section of the grand complex. While I held a place in the queue, Carole went off to another line to buy our entrance tickets. We were both thankful that I was wearing my brightly coloured Rasta tam and canary yellow Canadian ski jacket, as it did prove to be highly helpful when she returned to the growing, moving line of darkly attired bodies and easily spotted me in the massive crowd. 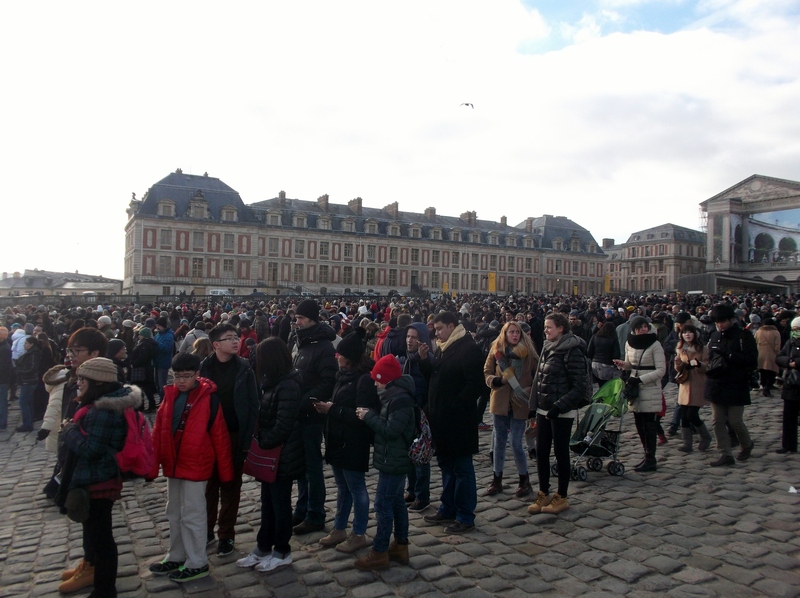 The seemingly endless winding queue generally waited patiently to enter the Palais Versailles. Thank goodness it wasn’t raining! While I waited for her, I gazed around me in complete astonishment. Yes, I had previously learned bits and pieces about Louis XIV, the ‘Sun King’ (as my former professor at Alliance Française de la Dominique, Carole had introduced me to this memorable monarch!). But I had really no idea of his power, influence, personality or creativity until I ‘set foot’ on the grounds of his palace. Of course, the massive structure was not his doing alone. Obviously, the highly skilled and talented artists, artisans, sculptors, builders and landscapers of that era could design and construct beyond the capabilities of most people, I daresay, even in the 21st century! After a three-hour wait, we finally approached the entrance way. But after all that time spent shivering, a bathroom was my first priority, once inside. I trembled with the chill and was thankful that the sun started to shine (appropriately!) as I could not shake the feeling of cold that penetrated my very being. Thankfully, my lovely friend had gone off in search of food a little earlier, and brought back the most delicious sandwich I have ever tasted in my life! It was a warmed soft (tortilla) wrap, containing three types of mild, barely melted cheeses ( I recall Emmenthal as one of them), which were covered in a mildly piquant sauce. That quick meal succeeded in reducing the shivers and hunger pangs for a few hours! 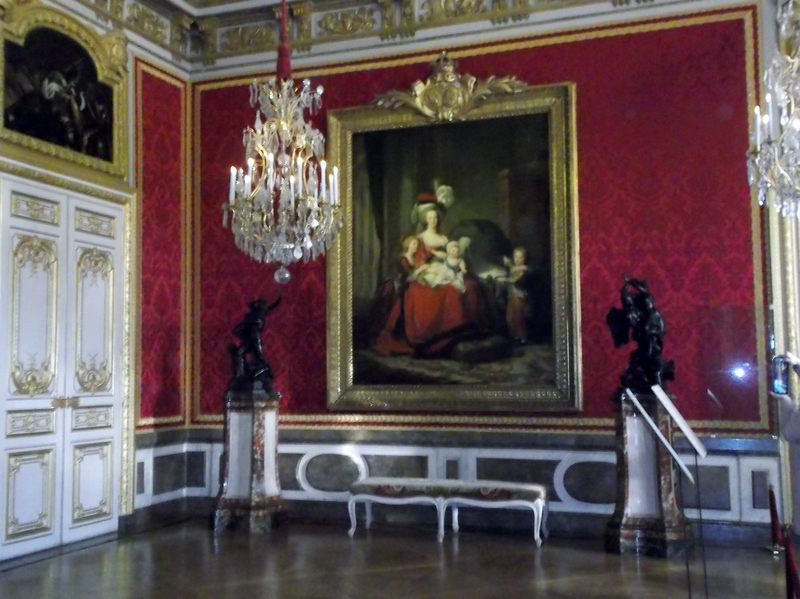 The Chapel was my introduction to the splendor of the rest of the Palace. 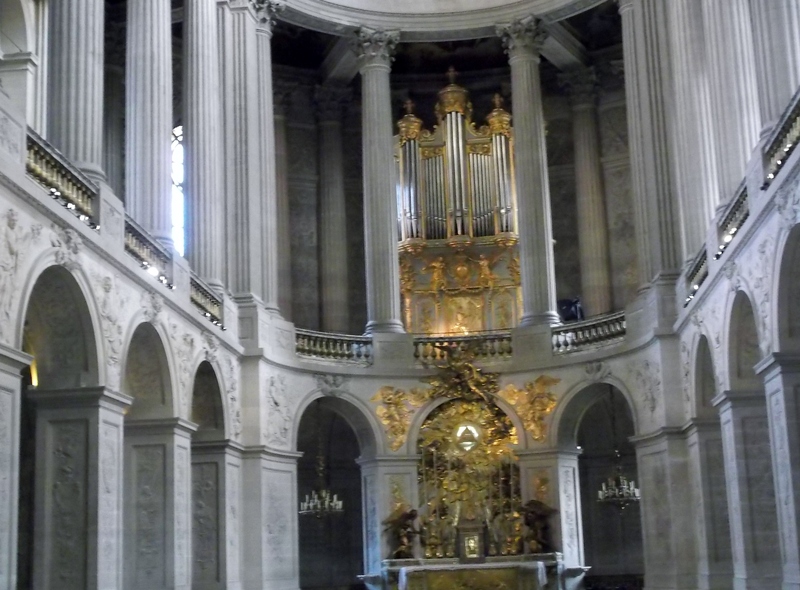 I only wish I could have heard the notes emanating from those organ pipes! 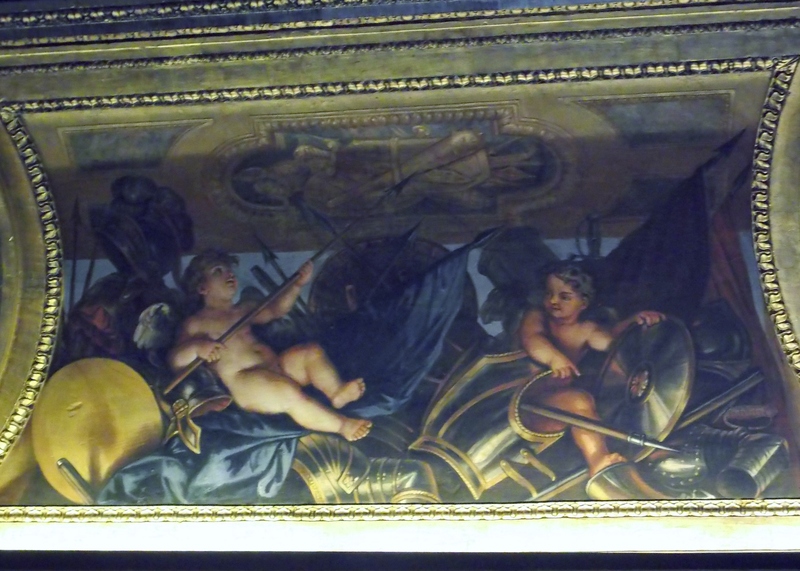 In every room (salon), there was a good reason to look up!Each ceiling depicted a scene related to a different mythological god or goddess, angels or demons! 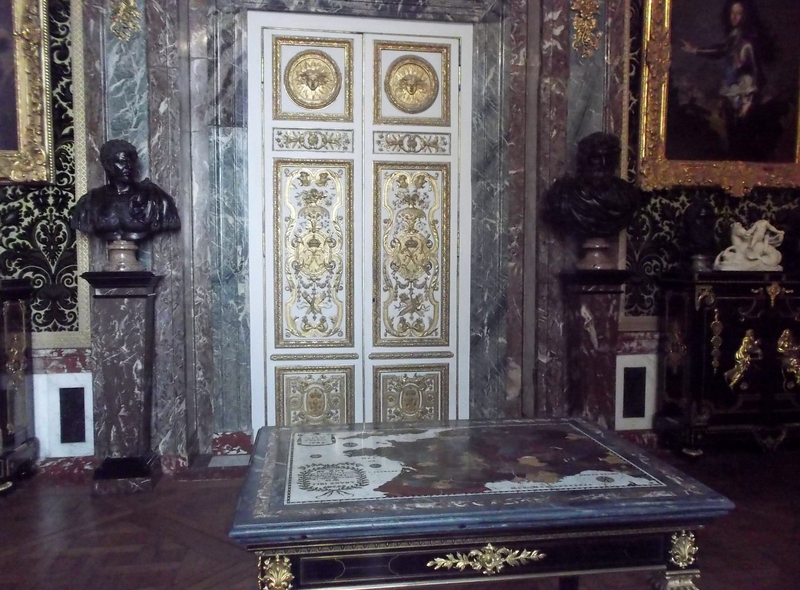 Elaborate busts, ornate doors, marble table tops…if I hadn’t seen this with my own eyes, I would have sworn the setting must have appeared in a dream! compelled visitors to “drop their jaws” in amazement and awe! 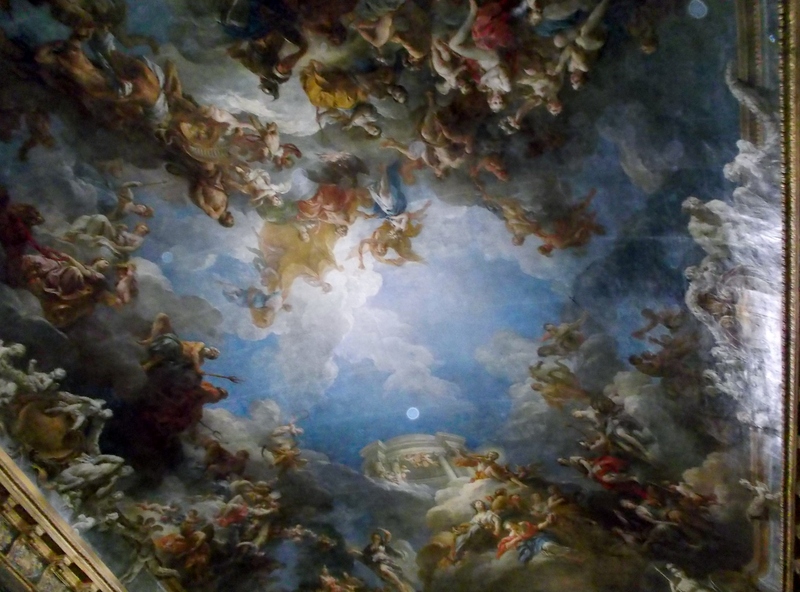 I am not well versed in mythology, but anyone who is would truly delight in the depictions of the gods that Louis XIV preferred. It was truly incredible that this long-lived and long-reigned king had turned his father’s hunting lodge into such an opulent abode. It certainly defies the extent of my imagination and I know I am not alone, as evidenced by the thousands who viewed the site along with me that day. 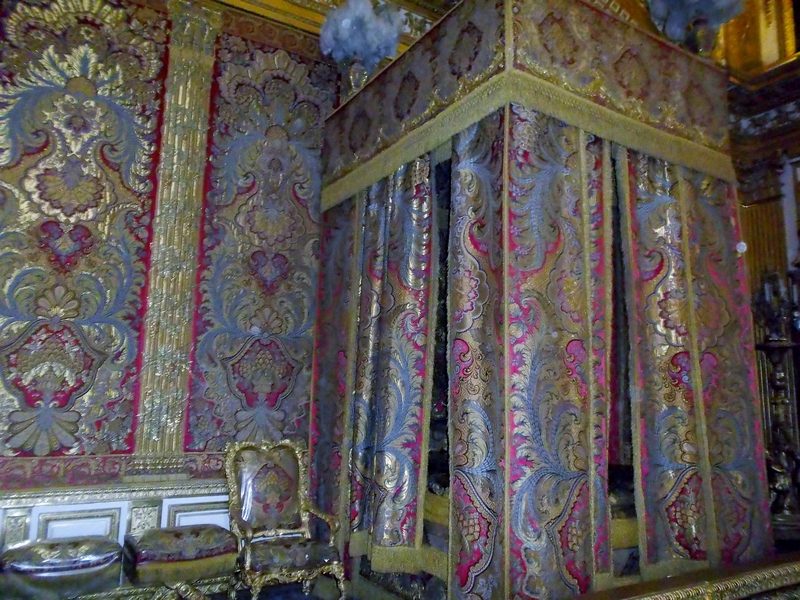 The King’s Chamber must have been the epitome of comfort (and privacy!) for Louis XIV! 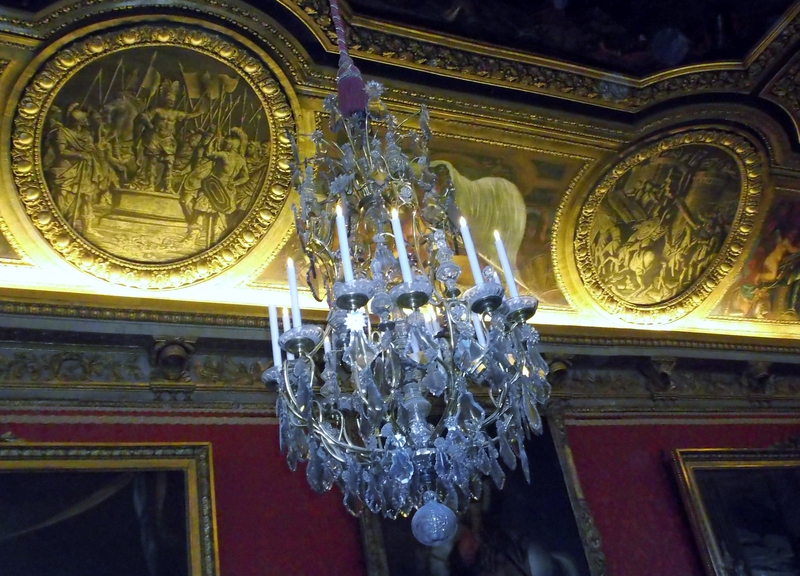 Imagine the coördinated efforts it would have taken to light the candles on the chandeliers in those days! The Queen had her own ‘salon’ too. But do you think there was only one beloved? I am not going to tell! Carole did make every effort to explain so many pertinent details to me. But I was so taken with the grandeur of the place that I could only nod, then gawk and gape some more! I simply marvelled at this structure and its elaborate contents. But I did also naïvely wonder how or if a building of such proportions with its elaborate artistic displays could ever be built in today’s world. The ‘Sun King’ certainly was a creative visionary, and he couldn’t have been worried about the cost of his mansion, even in the 17th century! There is definitely more to that story, so if you’re curious, I am sure you will search for the facts! After more than an hour, I felt satiated by this artistic feast and was now in need of some fresh air. Carole suggested that we spend a little time in “the Gardens,” and I eagerly agreed. We found a little food hut that offered hot chocolate, so we sat down (finally) for about 20 minutes and sipped the sweetness, while giving our weary legs a much-needed rest from the many hours we had spent standing up! 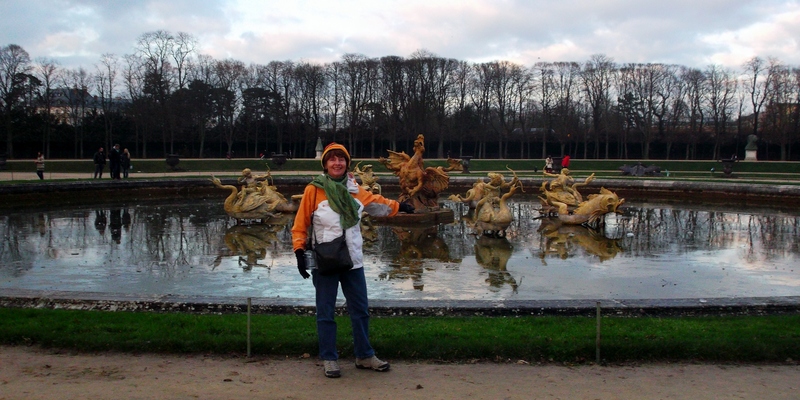 Carole poses in ‘the Gardens’ with the stately Palais Versailles behind her. 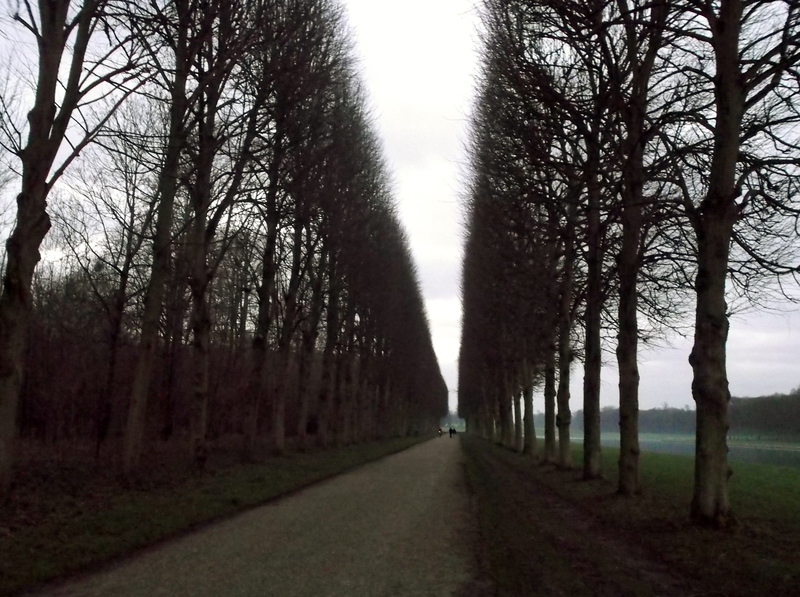 The trees along the pathways in the Garden of Versailles were perfectly symmetrical and evoked a feeling of serenity in me. The canal is on the far right. Gwendominica stands by the Dragon fountain. The Sun King certainly loved mythology! The Apollo fountain is situated between the Palace and the Canal.. Louis XIV apparently identified with this sun-god! The Grand Canal is in the background. After that little break, we both felt refreshed and decided to take a walk by the Fountains around the grounds, even though it was the middle of winter! 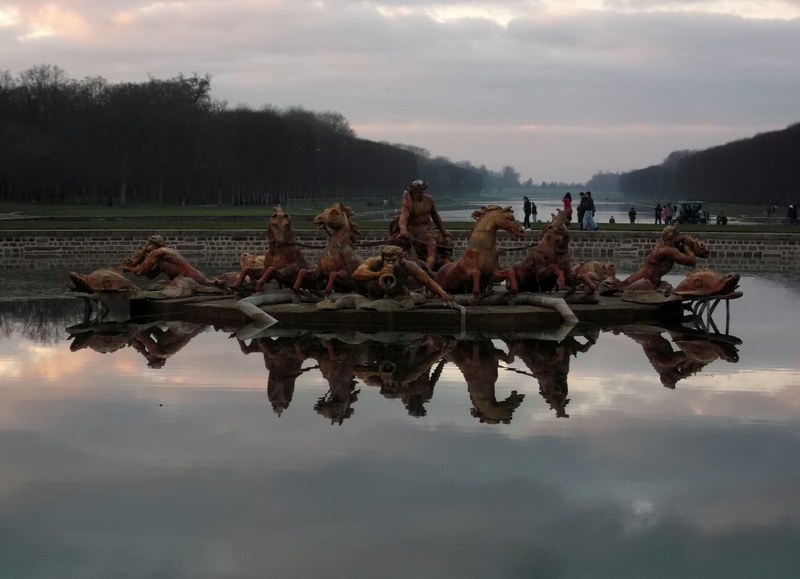 We were not deterred, and as we walked around, I was mesmerized once again by the natural and created beauty: stone sculptures, fountains, the mile-long ‘ Grand Canal’ and perfectly pruned rows of trees. As I breathed in the fresh cool air, I became entranced with the stillness and the silence. It was late in the day,we were almost the only people there. Occasionally, a bird chirped or a runner passed beside us. Sometimes we spoke and other times we retreated to our private thoughts. My mind drifted to an earlier time: I could almost visualize Louis XIV and his court strolling around the grounds in any season to improve health and well-being. Our leisurely saunter took us along the small body of water to its opposite side. At this point, it was quickly becoming dark. When I glanced at my watch, I saw that we had been on the move for over an hour! There were no artificial lights, so we turned around and hastened our steps back to the Palace where we exited the gate and walked a short distance to take the train back to the city. It had been a very long day and we were both pleasantly exhausted. As I look back on that magical experience, I realize how lucky I was to have had a good look and a new appreciation for the artistry of a fascinating time and place in France’s history! This entry was posted in Canadian Expatriates Blogs, Chemical Sensitivities Blogs, Chronic Fatigue Syndrome (CFS) Blogs, Environmental Illness Blogs, Gwen Whitford Dominica, Gwenith M. Whitford, Multiple Chemical Sensitivities Blogs and tagged Canadian Expatriates in Paris France January 2015, Canadian in Paris France January 2015, Canadian Tourist in Paris France January 2015, Canadian visitors in Paris January 2015, Fountains Palais Versailles Paris France, Gardens Palais Versailles Paris France, Gwendominica in Paris France, Historic Sites Paris France, Palais Versailles Paris France, Paris Travel Diary January 2015, Paris Travel Journal January 2015, Tourist Attractions Paris France. Here is the second installment of Gwendominica’s adventures in Paris.